MD5 Password is a password recovery tool for security professionals, which can be used to decrypt a password if its MD5 hash is known. MD5 is an industry standard hash algorithm that is used in many applications to store passwords. MD5 Password features fast, highly optimized recovery engine that can recover multiple hashes at once: up to 32,000 hashes in the Pro version. The number of hashes being recovered simultaneously does not have significant performance impact. The recovery engine is fully configurable, so you can adjust the recovery options as needed. MD5 Password supports the distributed recovery technology, which allows you to utilize the power of several computers when performing the recovery process, drastically reducing the recovery time. MD5 Password has a feature-rich user interface that allows you to utilize its functionality with maximum efficiency. The export and import feature can be used to export and import hashes to or from text files and the Report feature is used to generate text reports after the recovery process is completed. 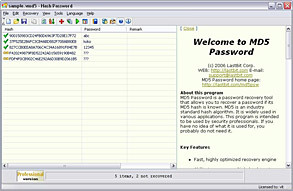 MD5 Password comes in two versions: Standard and Pro. The Standard version can process up to 3 hashes simultaneously and the Pro version has a technical limit of 32,000. Also Standard version does not support Smart Rainbow Tables Recovery. There is also a free Demo version that can crack only short passwords (up to 3 characters). Special offer! Buy MD5 Password Pro license and get SHA1 Password Pro for free! (Standard license does not include SHA1 Password). You can significantly improve performance by using your video card (graphics processing units (GPU)). Modern graphics processing units (GPU) are powerful dedicated processors, by much outdoing the regular processing units by their computing power. The parallel architecture of GPU is perfect for the implementation of brute force attacks for many (but not all) cryptographic algorithms. You can find more infomation here. We have also implemented Password Recovery Engine for Cell processor (used in Sony PlayStation 3); more information is available on request.